Now that the carburetor is rebuilt, it’s on to the engine. One of the first things I did when I started working on this bike was drain the oil, which revealed some interesting metal particles that had settled to the bottom. I’ve been straining the old oil through a paper towel, and rinsed off the pieces with carb cleaner to have a better look at them. Pic before cleaning the oil off. There are some tiny chunks, bigger than a grain of sand, that had been caught by the screen. There are also a few rounded slivers that clearly used to be drain plug threads (see pic at bottom of post). According to my father, he never had any problems with the bike, and that it indeed “ran when parked”. But the drain plug was something that he did have trouble with, and I was about to find out why. The bolt was cockeyed about 10°, pinching the washers on one side, but not the other. I attempted a re-tap, preparing myself to have to go get a bigger plug if necessary. The plug seemed to thread into its new threads nicely, but I wasn’t feeling good about cross-threading the existing threads, and the narrow head of the bolt wasn’t providing much of a sealing surface anyway. It wouldn’t hold oil, not even with this O-ring I happened to have on-hand. It was time for a proper plug with a proper washer. I picked up a M14-1.5 drain plug and gently laid the bike on its side. 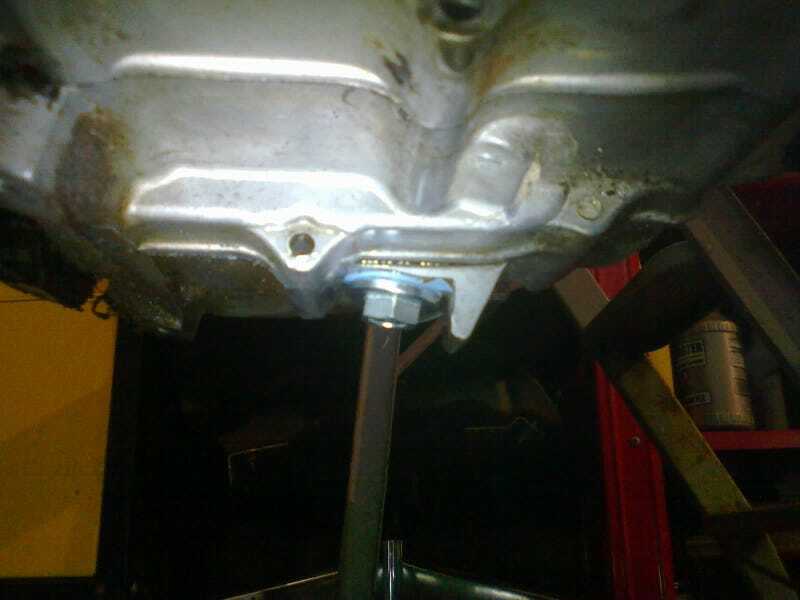 I then re-drilled and re-tapped the hole as straight as I could to accommodate the new drain plug, greasing the tap to collect cuttings, and pouring a little oil in with the bike upright to “rinse” remaining particles out. The new plug seemed to snug up nicely with its included washer, but I avoided putting much torque on it. All of my cars have had steel oil pans, and aluminum makes me nervous. Without any specs available, I took out my torque wrench and stopped tightening after 12 lb-ft, which felt tight enough, I guess. As part of the oil change, this bike introduced me to a new type of oil filter. It’s called a “centrifugal” oil filter, which was hiding behind the clutch cover. That’s right: each oil change involves removing the kick-start lever (1 bolt), the step bar (4 bolts), and the side cover (11 screws) to open up the engine. And to make things even more interesting, Honda decided to use Philips-head screws for that engine cover. Ever since learning about JIS screws on James May’s The Reassembler I’d been casually hunting for JIS screwdrivers during trips to tool stores. No dice. I’d have to order them. Which would take another few days. I took a philips bit and cut part of the tip off. I then took a Dremel with a cutoff wheel and VERY CAREFULLY widened the four flutes where the cross-section thickens to join the base of the bit. MSPaint visualization of my cut lines. Ta-da! Homemade JIS bit! To my great relief, it worked like a charm. File this one away in the hope you never need bin. With the cap off, the “filter” is cleaned by wiping away oil contaminants from the inside of that little cavity. I didn’t find any sludge, but I did find a substance like a thin paste, composed of motor oil and aluminum shavings that were even tinier than what the screen had caught. Almost like anti-seize compound, just not as thick. I just noticed those large brown chunks near the center of the pic. Not sure how they made it into the picture, but they didn’t come out of the engine.